Ever since we brought Sadie home from the hospital she has had a problem being regular. In fact during her two month growth spurt, she went once week to the day without making stinky in her nappie. We have been careful of what she eats and drinks and have had to keep a close eye on her problem down under. In 2009 the American Academy of Pediatrics increased the recommended daily fiber intake far above what was recommended before. ( “age plus 5”) For example…a 4 year old is recommended to have 25 grams of fiber instead of the previous 9. With busy lifestyles and running here and there its hard to count fiber grams and make sure our children are getting enough. Pedia-Lax Fiber Gummies are a delicious DAILY fiber supplement to help kids ages 2-11 maintain better digestive health and stay regular. They are sugar free, calorie free, gluten free and made with natural fruit flavors. They are also dentist approved. The suggested retail price is $7.99 for a bottle of 60 gummies. They are available at Target, Walgreens, also online and other supermarkets and retailers nationwide. 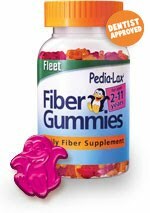 Visit www.fibergummies.com where you can get a $1.00 off coupon and use the store locator to see where the product is sold in your area. Their website offers helpful tips on how to incorporate a high fiber diet into your family’s busy lifestyle.